I recently had the good fortune of being invited along for a special presentation from Disney in the Odeon section of The Printworks in Manchester. Whilst there, my colleagues and I were given previews of their upcoming films such as Nick Cage vehicle "The Sorcerer's Apprentice", the first in a predicted trilogy "Tron: Legacy" and the video-game adaptation "Prince of Persia: The Sands of Time". The first looked quite entertaining, which is a big thing for a Nick Cage-hater like me to say. The second looked fantastic, and the broad outlook that Disney had for this franchise was just staggering, if slightly overwhelming. The third on the list actually looked well-presented, enjoyable and fun to watch. And I wasn't wrong in my assumptions. The overall film was quite a spectacle. 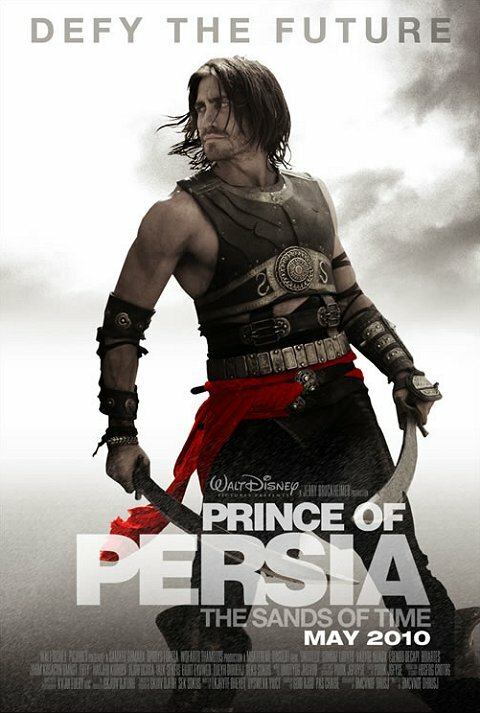 Prince centres on the rags-to-riches Prince Dastan (Jake Gyllenhaal), an orphaned 'street-rat' who becomes adopted by a kind King and is treated as if his own son. Some years later, Dastan and his brothers lead a siege against a local Holy City due to the reports of them harbouring some weapon of mass destruction (veiled metaphor for something maybe?). In the rush to protect their sacred relic, a mystical dagger, it falls into Dastan's hands, as does the fate of the world. The dagger can control time by rewinding the past for a minute to right wrongs. But Dastan's evil uncle (Ben Kingsley) wants the dagger for himself, leading Dastan and the dagger's guardian (Gemma Arterton) to try and protect it from evil forces. The director of Prince (Mike Newell) was at the presentation as well, where he spoke about how the film came to be, and the difficulties he faced when creating the film. He explained how one of the aims that he and the producers wanted to convey was their love for the Middle Eastern architecture and attention to detail that the researchers had found in buildings from that era. I cannot agree more with this statement. The level of detail in recreating the mansions, temples and royal buildings is staggering. Not only does it make you feel like you're watching events from that period, it makes you want to live there. The set pieces of collapsing ruins under a grand city, castle sieges from opposing cities and even ostrich races are handled with a fine degree of respect and panache, as you can usually guarantee from a Jerry Bruckheimer picture. Newell made mention that Bruckheimer's strength lies in his ability to know what the cinema-going audience want, and I can't put him wrong there. Whilst Prince of Persia may not be the new Pirates of the Caribbean, I felt thatPrince was a very well-crafted and well-balanced film. The main relationship between Dastan and Princess Tamina (Arterton) was crafted very well, and it held true to the relationship between the two in the video-game. Usually the sequels to these video-games have tried to recreate the animosity between the two leads from the original, and this is the first time I've seen it work well. I felt that both Gyllenhaal and Arterton carried their performances well and were effective in their lead roles, especially as this genre is something relatively new to both of them. And well done to Jake for carrying the British accent as I thought it would put me off, as it usually does, but it suited him well. The special effects weren't forced down our throats either. Whilst the action scenes require a fair bit of CGI to express the vastness of the sieges, the main special effects were saved for the time-travelling effects of the dagger. The dagger freezes time, and then quickly rewinds a minute, whilst the dagger's holder is left to watch as everything replays with a nice grain-of-sand and I felt this effect was used very conservatively to good effect, as it did not become stale and repetitive. Despite the general competent performances from the actors, I felt like Ben Kingsley's villain wasn't given the opportunity to be as evil as he could be. He spends most of the film being the villain from the shadows, advising the acting king to do the wrong thing, but I felt if he was allowed to sink his teeth into the role, he could have been a more formidable villain. Plus his main weapon were the 'Hassansins', merchants of death, who I felt too closely resembled the Ringwraiths of the Lord of the Rings franchise to be original. However these are mere annoyances that hardly affect the overall feeling of the film. Newell stated that they didn't set out to make a video-game adaptation, but use it as a basis for a whole new entertainment, and I feel it slightly covers both. There were enough high concept features to entertain the non-gamers, and yet in-jokes and appropriate parkour (free-running) action to keep the gamers pleased. I highly recommend this when the film is released in a month's time.